Mr. John Momoh is the Chairman of the Channels Media Group, and Chairman and Chief Executive Officer of Channels Television. He is a renowned broadcast journalist with a vast experience spanning almost four decades. Before founding Channels, John worked variously as News Anchor, Senior Reporter and Senior Producer for Nigeria’s National Radio and Television Stations, (Radio Nigeria and Nigerian Television Authority). In 23 years, he has gone from being a star employee to creating a multi-million dollar media enterprise, employing over 400 staff, across Nigeria and Africa, and reaching the World, with the same business model that analysts predicted would fail. His vision, passion and tenacity are balanced by a willingness to re-invent and pivot where necessary. 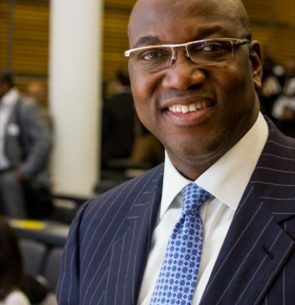 John Momoh is an alumnus of the prestigious Harvard Business School (OPM40) and the Lagos Business School (CEP7). He is a graduate of the University of Lagos with a Master’s degree in International Law and Diplomacy, and a B.Sc. (with honours) in Mass Communication. John also received Diplomas from the University of Lagos and the Thomson Foundation Cardiff. John Momoh is the Chairman of the Broadcasting Organisations of Nigeria (BON), the first private broadcaster to be so elected to lead the organisation. In December of 2005, he was conferred with the National Honour of “Officer of the Order of the Niger” (OON), by the Nigerian Government. He was honoured in 2006 with a Lifetime Achievement Award, by the Nigerian Information Society. Two years later, he was crowned ‘Entrepreneur of the Year’ by the Fate Foundation, Nigeria. And in June of 2013, he received the Distinguished Alumni Award from the Lagos Business School. In December 2015, John was conferred with two awards; the “ZIK Award for Entrepreneurship” and the “Entrepreneur of the Year Award”, by the Institute of Directors, Nigeria. John Momoh is a member of the International Academy of Television Arts & Sciences based in New York. He serves as a JUROR for the annual International ‘Emmy Awards’ and the ‘AIB’ Awards, organised by The Association for International Broadcasting. His television station Channels TV, is the only Nigerian and indeed African Broadcaster to have won the “Television Station of the Year” Award, a record Eleven times, six of them consecutively. First Nigerian TV Company to interface with followers via Twitter. First Nigerian TV Station to complete its mobile Apps on various platforms (Android, Apple, Microsoft, Nokia and Blackberry). First and only Television Company in Nigeria with over 3 million followers, and subscribers on the social media. First media Company to incorporate the use of Skype and Google hangouts in its news and programs. The Channels TV App is the only App in the Nigerian Android store region to have reached the 1.5 million ‘installations’ mark. The Channels App has been ranked ‘Best App’ in the Apple Store, in all categories. Channels is the only Nigerian TV Company whose app has been consistently selected and featured on the Windows store. In recognition of his entrepreneurial dynamism, two Nigerian universities recently conferred honorary doctorate degrees on John Olatchy Momoh. They are ”Doctor of Business Administration” by Ambrose Alli University Ekpoma in Edo State, and ”Doctor of Science” by Crescent University Abeokuta, Ogun State. John is happily married to Sola, also a broadcaster, and they are blessed with three children.